A few years ago, the Puslinch Historical Society purchased four microfilm reels from the Ontario Archives which contain some early documents relating to settlers in Puslinch from the year 1830 to the 1850s. 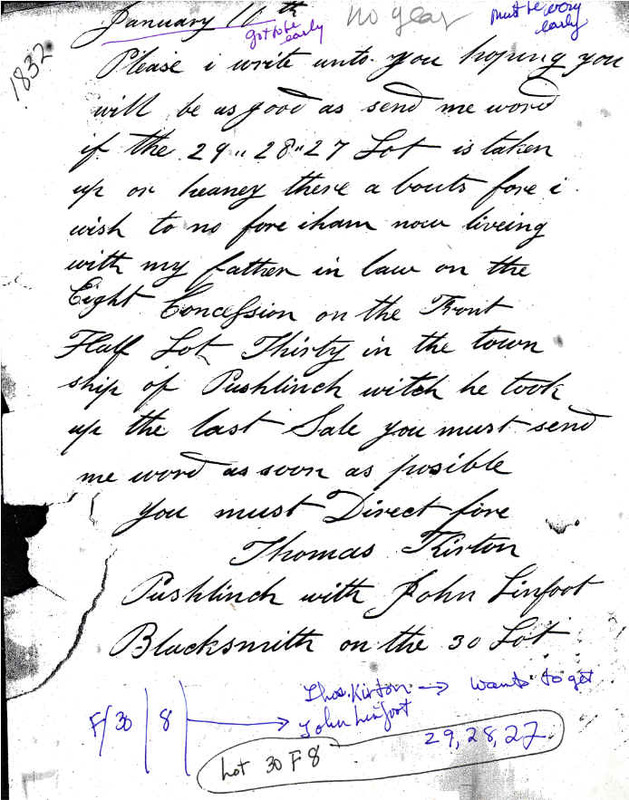 These Township Papers include queries about available land, letters to land commissioners clarifying locations, transfers of land from one settler to another, quit claims, records of installment payments, petitions and, in a few cases, furious letters detailing the disputes that arose among these early occupiers of Puslinch. Some of the names are those of people who were speculating in land , some of people who only stayed briefly in the Township and some of people who eventually made a legal land claim and stayed in the Township for up to a hundred years or more. The Papers are arranged in order by lot and concession so that it is relatively easy to find the documents relating to a particular lot and documentary material can be found on almost every lot in the Township. We undertook to print out as many of the Papers as we could to make research independent of a microfilm reader easier and will be in the process of doing that for some time for there are over 3000 items. However, several binders have already been filled with print-outs and it seems desirable to provide a list of our progress so far. Please note that while some concessions are nearly complete, some which were in response to queries from website correspondents, are barely started. Please let us know if you would like the lot and concession of any land that interests you. Lots 1, 2, 3, 4, 5, 6, 7, 8, 9, 10, 11, 12, 14, 15, 16, 17, 18, 19, 20, 21, 22, 23, 24, 25, 26, 27, 28, 29, 30, 31, 32, 33, 34, 35, 36. Lots 1, 3, 4, 5, 6, 7, 8, 10, 11, 12, 13, 15, 16, 21, 22, 23, 24, 25, 26, 27, 28, 29, 32, 33, 34, 35, 36. Lots 1, 2, 3, 4, 5, 6, 7, 8, 9, 11, 14, 15, 16, 17, 18, 19, 20, 21, 22, 25, 27, 28, 29, 31, 32, 33, 34, 35, 36, 37. Lots 20, 21, 22, 26, 36, 37. Puslinch is particularly lucky that so many of its Papers are preserved. To see what other townships have such Papers, researchers can look under Townships on the Provincial Archive website.